1.) Does a market exist? Basically, are there customers willing to pay for your product or service. Most products and services are an extension of something that already exists, so you know that a market exists. This question becomes even more important as if you are offering a disruptive product or service. 2.) How big is a market? Basically, are there enough people who are willing to pay for your product to sustain your business. You must also consider at this point how many competitors are there and how entrenched are they. For example, if there is a million dollar business but there are already a dozen competitors, there will not be a lot of unmet demand. Then your business will have to out perform enough of the established businesses to squeeze into the market. 3.) Is the market concentrated? Basically, how spread out is the market. It you are providing a service where you have to be present but your customers are spread across a 250 mile strip, it may not be a workable scenario. With the power of the internet, it is significantly easier to service a market that isn’t concentrated. You may have to structure your business differently depending on how and where your customers are located. Unbound dreaming identifying where you company could be in a handful of years without resource or competitive limitations. Answer the question, “what would I want this company to be three to five years from now if I had all the resources I needed at my disposal?” Include hard to define but still emotionally powerful phrases like “best in class” and “market leader in . . .” Write up the unbound dream in no more than three or four pages which should include several images that convey the emotion embedded in the dream. While there are no limits (therefore, “unbound”) in creating the dream, the limited amount of room to convey the message will require a certain amount of prioritization. Be careful in how fully this dream is shared. In most cases, companies will want to keep this dream within a few relevant executives and managers and to not share with the general employee base or even to the customers. While the dream is exciting, it is inherently unrealistic and that is ok. Realism comes in the next step. Look at the emotionally packed but largely meaningless phrases like “best in class,” and really understand what each phrase actually means. With the phrase “best in class,” how is “best” measured? According to who? If you were to bring whatever is best in class to a third party lab to compare to competitors, what criteria would you give that lab to determine “best.” Does the customer use those same criteria? As the dream becomes understood, it will become obvious that parts of the dream simply are not obtainable. If that isn’t the case, the dreamers didn’t do their job in step one. They needed to have bigger dreams. In this step, start to prioritize pieces of the dream. Don’t necessarily dispose of impractical parts of the dream, but lower their priority. They may become practical in the future. It will become necessary to start working up timelines so that the company can understand what is possible. At this point, all the math must work. The pro-forma P&L five years down the road must make sense and it must exceed the required profit. Now that there is a detailed pervasive understanding of the dream, start to work backwards through the calendar to establish what will be necessary in each year. For example, if the company is going to become the “best” (however that is defined) product in its category five years down the road but currently is a middle of the road product currently what steps and investments are required to improve the product so significantly. Tactical pathing includes details like how bonuses will be calculated, which positions need to be added to the org chart, which need to be eliminated, which segments should marketing be focusing on, etc. To be done well, tactical pathing requires input from a wide range of employees. Employees should be given opportunities to challenge the dream. This will create a more realistic path as well as help employees take ownership. Walking the path is simply starting to execute the tactical path. As with any path ever walked, unanticipated obstacles and turns will arise. Competitors won’t behave as predicted, technology may take yet another leap or your customer’s tastes or needs may change unpredictably. As with any path ever walked, when an obstacle or unplanned turn appear adjust your path but keep your dream firmly in mind. The company’s dream is more important than the path taken to reach it. How do you know what your customers what? Understanding what the customers want is incredibly important to running a successful business. It allows you to invest in areas the customer values (and would be willing to pay for) while cutting investment in items/features that the customer doesn’t value (and would NOT be interested in paying for). So how do you know what the customer wants? While there are many ways and I encourage you to use several of them, one of the basic methods is to look at the data you already have. If you are able to track purchases at the customer level, you have an incredible amount of power in understanding customer behavior at your fingertips. One great way to understand different segments of your business is to create a Customer Preference to Purchase chart. Group your customers based on their average purchase frequency and average purchase value. Then for each group, list where the top 50% of sales are coming from (or profit if you have widely varying margins). Group your products/services at different levels to see what differences come up. I created one for a made-up burger joint below. 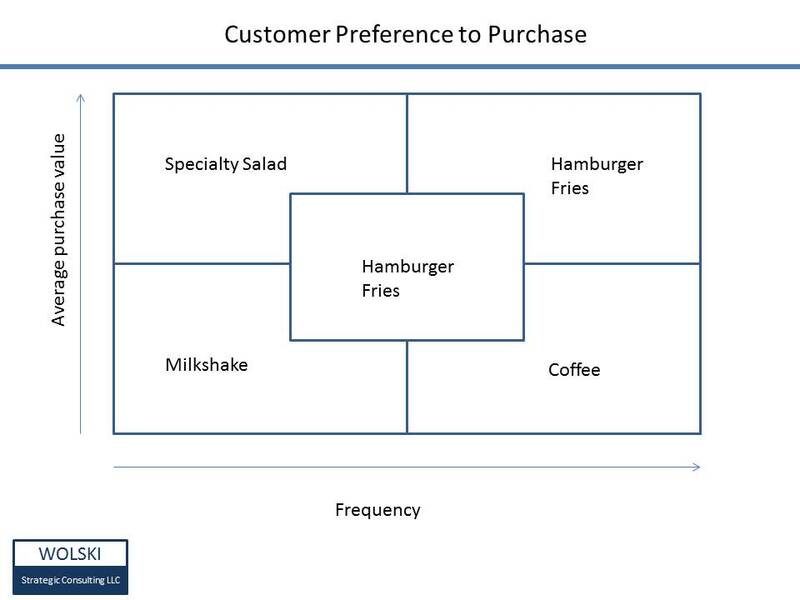 Basically, both the average customer (box in the middle) and the high value customers (box on top right) are burger and fries customers. The high frequency but low average purchase customers (bottom right) basically just stop in for coffee in the morning. Note that at this level I didn’t separate out my single patty from the double or triple patty. Drilling down to that level may help important depending on what you are trying to accomplish. Another useful way to populate the boxes is to look at how this segment differs from the norm. It can be as simple as comparing the percent of business a given product category does for your customer segment vs. what it does in total. For example, dessert may be 20% of the high frequency/high purchase value but only 5% of your total business. This means that high frequency/high purchase value customers are four times as likely to buy a dessert. “Why” is the basis of successful businesses. “Why” the company is in business and “why” the customer should select one company over another together guide a company’s actions. This is what drew me to “Start with Why” by Simon Sinek. The premise of the book is good, basically organizations need to have a clear sense of why they are in business and “what” it does and “how” it does it should reflect the “why.” Simon proposes that organizations need a leader of “why” to keep the organization focused on its reason for being and then it needs people who are able to transform that “why” into action. He further proposes that by simply being true to the organization’s why will drive customers to the organization. Unfortunately, Simon did not do any rigorous research on if his theory. The book lays out Simon’s musings on the subject, which aren’t without merit, but I was hoping for more. The first 50 pages of the book are definitely worth the read but the book goes on for another 150 pages. Overall, I like the concept but I don’t feel like Simon Sinek has done it justice. Many businesses analyze project results backwards. Typically, a manager will put together a project proposal that has to go through some financial approval process. The project will run. Then the manager will work with an analyst to see what happened. They will look for the good news to report to their supervisors. For example, if sales didn’t increase, the manager and analyst may look at sales per customer or number of customers. If not either of those, perhaps units increased. Now with new media, they may report back on Facebook likes or pins on Pinterest. 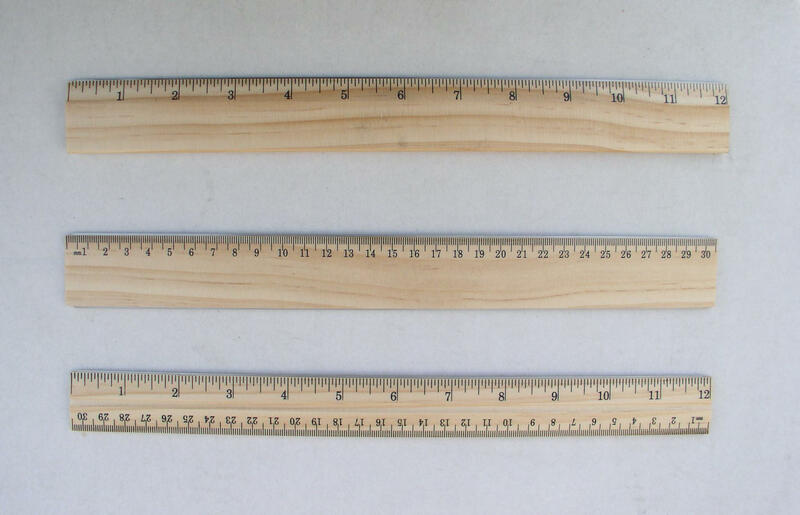 When a project goes through the financial approval process specific thresholds on each yardstick need to be assigned. For example, “provided a positive and lasting change to sales trend” might have two thresholds set on a given project, 3% increase over trend target and 6% increase over trend as a stretch goal. Once the project is run, the first paragraph of the analyst’s report should include measurement to thresholds on the overall yardsticks. If the project exceeded the target on the overall yardstick, the project worked. If it did not exceed the target, then it did not work. The manager can still report on positive secondary results as learnings for future projects but whether or not the project succeeded in delivering the primary goal (the overall yardstick) is clear. Originally created in the Toyota Corporation by Sakichi Toyoda as part of the Toyota Production System, the five whys is a simple yet effective tool for driving to the root cause of an issue. In utilizing the five whys, state the issue and then ask “Why?” Once you have a satisfactory answer, again ask “Why?” to the answer. Repeat asking “why” until you have discovered the root cause. Generally speaking asking “why” five times is sufficient to determine the root cause. For example, 1.) Why was the wrong product shipped to the customer? Because the sku in the catalog was incorrect. 2.) Why was the sku incorrect? Because the error wasn’t caught in final proofing. 3.) Why wasn’t the error caught in proofing? Because too few people are part of the proofing process. 4.) Why are too few people part of the proofing process? Because the draft was delivered late to the team. 5.) Why was the draft delivered late? Product marketing was late in providing final information to the catalog team. This error was really caused by product marketing being late with information. Of course, “why” could be asked several more times in this example before a satisfactory solution could be found. The five whys is frequently used in very process oriented systems, such as manufacturing, but it also fits very nicely in marketing and strategy development. Consider trying to discover why a consumer prefers a competitive product (see below for the first level of questioning). Use field sales, customer service, management, analysts and insights team to pick the top two or three reasons why the customer prefers the competition. Then for each answer, do some research. For example, competitively shop your competition and determine how your organization’s pricing measures up. Then for each researched answer, ask the most relevant “why” question. Repeat until you have several paths of root causes for your team to provide solutions. The five whys can also be used to build a solid story for marketing or social media campaigns? Start with why the customer would care about the story. Several levels and frequently the root of the customer’s motivation will present itself. Build your campaign to communicate directly to your customer’s root motivation. Another use would be to determine target customers and best methods for reaching them. For example, why are Boomers less likely to use our product than Gen X? Or why are women more likely than men to use our product. Wolski Strategic Consulting is a management consulting firm focusing on organizational strategy and marketing needs. I started my firm as a creative and entrepreneurial outlet last September and have really enjoyed how much I’ve learned already. I am Tim Wolski. I have nearly 20 years of strategy and marketing experience from notable companies including Swarovski, Samsonite and PartyLite. My success in these companies has been directly linked with my ability to ask, “Why?” and the question “Why?” is the crux of what Wolski Strategic Consulting can offer an organization. Strategy to me is an alignment of effort toward a common destination. That destination is measured by every company differently. One business may be interested in growing new customer acquisition. Another may be focused on maximizing service to its existing customer base. A non-profit may measure its destination by how many hours of service it provides. No two organizations’ strategies are exactly alike and nor should they be. Each strategy. Each destination is unique to that organization. In its most simple form, creating a strategy requires two steps. First, determine the right destination for that organization. Second, map the right path to that destination. The best destination can only be selected once the organization knows what the customer wants, why the customer wants it and why does the organization exist. I want to help businesses and organizations find their destinations and paths through insights on the customer and the organization itself.